Obituary – Sharp, Dollee Sue (Pierce) « Perry High School Alumni Association, Inc.
Dollee Sue Sharp, 59, passed away June 7, 2015 in Tulsa, Oklahoma. Her services will be held at 10 a.m. at the White Cloud Building in Perkins, Oklahoma. Interment will follow at the Iowa Indian Cemetery. Strode Funeral Home is in charge of the arrangements. 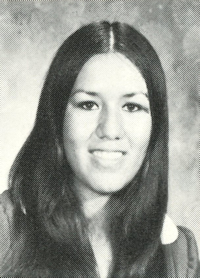 She was born on April 10, 1956, to Donald and Emily (Twoguns) Pierce in Pawnee, Oklahoma. She attended Billings Elementary School and graduated from Perry High School. She worked as a secretary for the Iowa Tribe. She is preceded in death by her parents and brothers Kevin Pierce and Donald E. Pierce Jr.
She is survived by two sons, Sylas Eugene Walker and Aaron Lee Pierce; two daughters, Jessica Ambrielle-Keith Canaday and Felicia Ann Brightbill; eight grandchildren, Gage and Colby Canaday, Hunter and River Harp, Dylan Walker and Jacob and Karis Brightbill and Britney Taylor. She is also survived by brothers, Frank and Charles Pierce.